Being a yogi equates with a fine-tuned sensitivity and a willingness to meet things head-on. This also leaves us more vulnerable. So how do we continue to stay tuned-in and engaged within the current antagonistic political climate, without getting pummeled with each new wave of contention? The key lies in the very practice that disarms our defenses–using the yoga practice to cultivate our own spiritual warrior. As the body and mind is purified through the yoga process, we develop a fine-tuned awareness of the environment meeting our senses. The overall effect is that our experiences become more vivid. This clarifying effect on our physiology is a result of the opening of nadis(energetic channels in the mind-body) and the release of toxins, both emotional and physical that naturally occur as we combine breath work with the asanas in an organized manner. The bliss-like high that many experience after yoga is a lovely result of this process. At the same time, we need to take care of our sensitive instrument by balancing it with stability and resilience. By using the science of Ayurveda, we can nourish the nervous system. We learn to move towards, not away from what we are experiencing in the body, emotions, and thought patterns. We practice a sattvic way of living–limiting numbing and disturbing substances like alcohol, drugs, shallow conversations, violent media, junk food, etc. This balanced lifestyle eliminates much of the distractions from our daily realities. However, this confrontation is an artful dance. To face what is happening in the moment, we need to be able to hold it with that wide-angle lens of awareness. This is that witnessing capacity that is aware of the emotions, while they are happening. The art is understanding our own rhythm and capacity. At times, we may need to back off from intense emotions and sensory stimulation in order to recharge or calm our energy before bravely turning towards them once again. When feeling overwhelmed, the yogi learns to turn her attention skillfully onto a healthy object of focus like the breath, body, mantra or sound. She is then ready to face whatever is in front of her. Through the practice of skillful attention, we learn to cultivate an inner refuge to rely on during the big storms of life. And, when we begin to rest more often in awareness, we see how all of us are, as Thich Nhat Hanh calls, “inter-being.” For example, our yoga practice wasn’t created in a vacuum. It comes from a long line of yogis, whose teachings have inspired many beings before reaching us on our own yoga mat. The fruits of our own practice rub off on all we come into contact with, contributing to this shift in collective awareness. Truly, we are experiencing yoga as a vast timeless stream of consciousness. This union with the true Self is the goal of yoga, but still most of the time we tend to reside in a state of division–this is my body, my feelings, my viewpoint and everything else is “other.” Inherent to this divisive mindset is fear. Fear that in our separateness, we have to be better than someone else and compete to have resources, love, happiness, etc. The true divisiveness of our time is in our own inner division. Fortunately we can each take on the responsibility to heal this division. Yoga, which literally translates as “to yolk” or connect is the perfect practice to do just that. Stability can be nurtured in our practice through longer held postures with a focus on hips, thighs and feet. In alignment with Ayurveda, the healing sister science of Yoga, we create stability by balancing the Vata dosha–air and space elements. Vata dosha is the prevalent energy of the nervous system and in a climate where collective anxiety is high, we need to take extra care of this aspect. Vata also finds its home in the pelvis, colon and thighs. 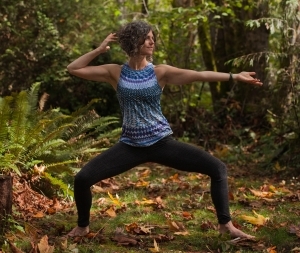 To balance Vata, we slow down the practice and really connect with the earth through our feet, building the scaffolding of the poses from the ground up. We emphasize opening the hips and thighs, and keep our breath slow and even. Think warrior 2 variations, thigh openers in lung or pigeon and seated hip openers. Focus can be cultivated by working on balance postures. In balance postures the eyes rest in one spot, the core is gathered inwards, the movement of the pose becomes subtle and our mind becomes still and focused. We can build slowly, starting with a warm-up using balance shapes on the ground–shapes like navasana or one-legged extensions from hands and knees. This strengthens the core, but also helps to gather our attention. We can then move from easy balance shapes on two feet such as chair pose with the heel off, to one-legged balance postures like tree pose and dancing shiva. Focused attention shapes neural circuits, enhancing our brain’s capacity for mindfulness. (R. Hanson, Buddha’s Brain) Being able to bring our mind back to a calm center is an amazing tool to decrease stress. Connection can be cultivated through intention, devotion(ishvara pranidhana) and chanting. Start the practice with the intention to be mindful–to connect back to awareness throughout the practice. We tenaciously notice what we are feeling–physical sensations, emotional qualities, inclinations, thoughts. As we continually notice what we are feeling in the practice, we strengthen our ability to show up and connect to this awake consciousness. In doing this, we feel a deep sense of being seen, listened to and taken care of. This is a self-sustaining refuge, literally, and depends on no one else or any particular circumstance. As we do this over and over we build confidence in befriending ourselves and the abiding sense of being supported by this consciousness. Ishvara pranidhana means surrender to God/ supreme consciousness/ present awareness/ spirit–whatever word(s) you prefer to reference this life force. We can end the practice by surrendering the fruits of our practice to this supreme consciousness. In this way, we expand our motivations beyond personal desires, into sharing what we have cultivated in the practice–the open-heartedness, goodness, and clear mind, to benefit all beings everywhere. To feel into inter-being, add in chanting. Even if you are practicing alone, the connection to the ancient language and the many yogis that have chanted the words before you, links you to the lineage and the larger yogic consciousness. The current chaotic political climate has the potential to create a lot of disturbance in the mind-body. However, a resilient inner stability combined with focus and a deep connection to spirit, is a yogi’s strength, protection and refuge. Sadhana, sadhana, sadhana.